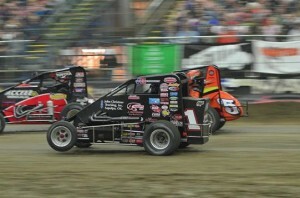 Abreu strikes at Chili Bowl night two | Talking Speedway, Speedway news from around the world! The Bowl has a Toyota feeling about it with first Larson and now Abreu taking the praise of the massive Bowl Crowd and now the pressure will move onto teammate Christopher bell when it ‘s his turn to fire his Beast Toyota looking for 3 from three for the Kunz Toyota Team . 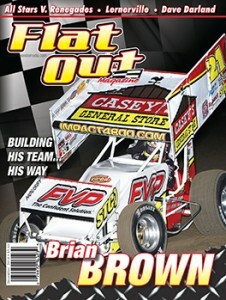 Abreu started out of position 6 and found early pace to advance to 4th on the opening lap. Windom had the early race lead from Marcham and Blake Hahn. Abreu found the cushion early and soon found his way around both Marcham and Hahn. Lap 15 and the cushion work by Abreu soon paid dividends as he managed move past the early leader Chris Windom. 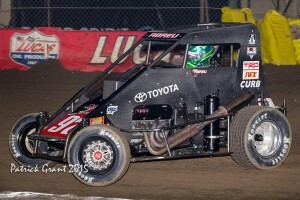 The 2014 USAC Champion and his little Beast Toyota then controlled the race to cross the strip 2.75 sec ahead of Chris Windom .Blake Hahn looked likely to get second but as the race entered the final laps a fast finishing J.J Yeley raced wheel to wheel with Hahn and it was only in the last two corners that Yeley managed to get that final drive out of the corner to edge Hahn from third and the transfer spot into the Championship Final. Abreu raced with confidence and always looked in command but the apart from Rico the night belonged to the old stager Sammy Swindell. Sammy’s night started with a black fag for a lost muffler making the 5times Bowl Champion work through D , C, and B Features before having the chance to qualify. Swindell was the master , a stallion against a lot of ponies as he made his way into the A Final .Starting from P 18 Swindell managed to get to 5th and just missed the transfer spot During the night Swindell passed 45 cars. Third place JJ Yeley at the post race interview “You have to run hard no matter what when you’re here. The race track got really treacherous and you had to be smooth. I think he [Blake] was trying to regain maybe the spot he had given up there, and obviously when you are coming down to the last couple of laps, you are going to do everything you can to get in that top-three,” commented Yeley of his final lap battle with Blake Hahn.